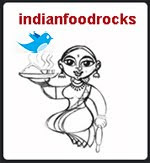 Indian Food Rocks: What kind of a guest are you? It started with water woes in Bombay. Barely enough water; for too short a time. We were not able to shower for over 36 hours since our arrival. Ick. It was winter for them but it was warm and humid for us! There was no question of washing any clothes either! After checking with Anita, I decided to carry our laundry to Delhi. She assured me that her washer squeezed the daylights out of the clothes that they barely took an evening to line dry. Unfortunately for us, the sun decided that it would take a break that very day to let the clouds reign and, yes, our clothes didn't dry. Not that evening nor that night. I was now looking at several tall clothes-racks worth of damp clothes that I needed to take with me to Agra and Jaipur. I was already shaking from the visions of smelly rotting clothes by the time we got to our hotel. So I got to work briskly and did the one task I hate more than doing laundry itself: ironing. I chose the bed as it had the largest surface area. Tees and shirts were a breeze. The jeans killed me. And then, there was more. Suddenly, the blue sheets I was looking at, turned into large — and I mean really large — splotches of dark red. Huh? I had burned right through the sheets to the red mattress underneath and scorched that, too. In my haste, I did not place a sheet on the bed as I had assumed that the sheets were cotton and that the mattress would be, too. Mine are and I live in the land of everything synthetic. When I lived in India, all my mattresses and sheets were cotton so hers had to be, right? Wrong. Those sheets were a gift from someone, had a synthetic fiber in them and had never been used before. The red mattress was an expensive orthopedic kind. Brand new sheets. Brand new mattress. Ruined. By me. The exemplary guest. At that point, I wanted to scream and wished the ground would open up, swallow me and those darned damp clothes. Medha, on the other hand, was very excited that it wasn't her but me, the infallible, who had done something wrong. You can't hide that, you know! You're going to have to tell her! I mean look at the size of those holes in the sheets! La! la! la! La! LA! She danced all around me as I tried to whack her with a damp pair of jeggings. Anita soon strode into our room to tell us that we needed to get our act together as the rental car was on its way. In one fell swoop of her eagle gaze, she saw. Yes, that ground definitely needed to do its thing but it wasn't budging. The good host that she is, she didn't say anything but just lay down a thick sheet on the bed and asked me to iron over that instead. All I could do was whimper my apologies over and over again. I had barely met her and here I was, testing our friendship already. But, you know, I am lucky, lucky, lucky to have the most genuine people as my friends. Anita was hugely matter-of-fact about it all and brushed it off as any gracious friend would. As Jen put it the other day, albeit in another context: friends are important because they will love us no matter how moronic we are. Apparently, I can be worse than moronic. As a peace offering, I brought Anita a Rajasthani bedspread with pillow covers from Jaipur. She had a near-identical bedspread. I felt like I just could not win. So as a final peace offering — because she has a bunch of gelatin packets she needs to use up — here's a panna cotta that I made as dessert for a dosa party that I hosted last Friday. I didn't have enough time to bake, prep or stir and yet I wanted something with Indian flavors. I had a tin of Kesar Mango Pulp and I had half-and-half. The stage was set for a panna cotta redolent of kheer and aamras. I based this on David Lebovitz's Perfect Panna Cotta recipe, substituting half-and-half for heavy cream. Crush each cardamom pod lightly to open it and remove the seeds from within. Pound these into a fine powder using your mortar pestle. Take 6 tbsp of cold water in a medium bowl, sprinkle 2 packets of gelatin over it and allow it to stand for 5-10 minutes or according to the directions on your gelatin packets. Heat half-and-half in pan over medium-low heat, add sugar. Stirring occasionally, heat until the sugar is dissolved. Take it off the stove and add vanilla extract as well as the cardamom powder to this half-and-half mixture. Mix well. Pour the warm half-and-half mixture over the gelatin and stir until completely dissolved. Divide this panna cotta mixture into at least 12 or more dessert glasses, shot glasses or even wine glasses, leaving as much or a little less room for the mango mixture at the top. Cover each individual glass with plastic wrap and chill in the refrigerator for between two to four hours. Once the panna cotta has set, mix lemon juice with water in a medium bowl and sprinkle gelatin over it. Allow to stand for 5-10 minutes. Same drill as for the panna cotta. Warm mango pulp gently at medium-low heat for a few minutes. Take off the stove, and add freshly pounded cardamom powder and stir well. Pour mango pulp over gelatin mixture and stir until completely dissolved. 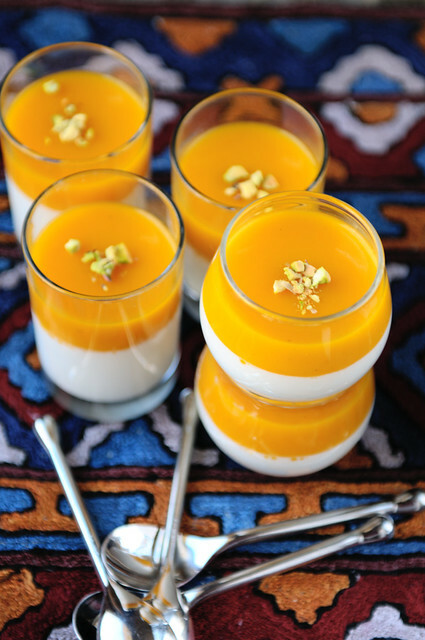 Remove the panna cotta from the refrigerator, uncover and spoon the mango mixture into the glasses. Cover and refrigerate for another two to four hours until the mango mixture has set. Before serving, remove plastic wrap and garnish with crushed pistachios. I wish I had remembered that I had pure Kashmiri saffron and added that to the panna cotta as well. Next time! The mango pulp is already sweetened so the lemon juice helps by adding a hint of tartness to the pulp. Sometimes my gelatin does not dissolve completely. When this happens, I strain the mixture before pouring it into the glasses. I usually have mango mixture left over. I pour it into wine glasses and offer it to those who cannot handle dairy. I don't bother unmolding the panna cotta as that increases the number of glasses and bowls used. If you want to unmold it, then reverse the steps and make the mango mixture first, allow it to set and then pour the panna cotta over it. But really, why? My friends loved the Indian flavors of this panna cotta even though they haven't tasted aamras before. 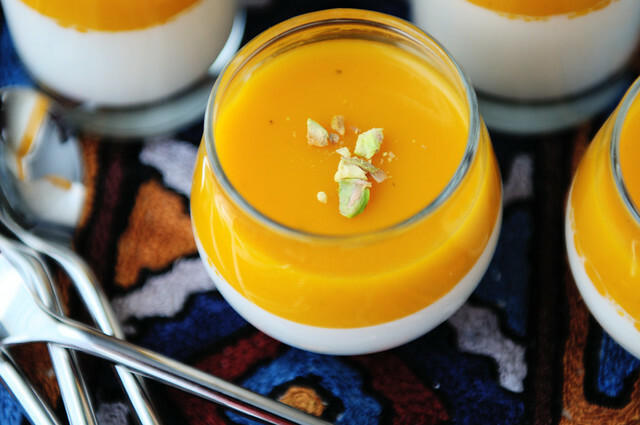 The touch of aamras really made this panna cotta memorable. A reasonably delicious peace offering, I think! So, what kind of a guest are you? I'll do the dishes (though I find that about half of the people for whom I'll offer get twitchy about it). And my mother always believed in changing the sheets in the guest bedroom (though I hardly ever stay in a bed), but we'd leave the sheets bundled by the door so that the hosts would clearly know which sheets in the house were clean and which were dirty. Vacuuming is over my line and I'd worry I was being pushy and seeming critical of my host, but if I had a guest who offered I'd be thrilled. Everyone makes panna cotta looks so simple, but I haven't gotten up the nerve to buy gelatin yet. This sounds amazing! I love panna cotta and this mango version sounds delicious. I can't wait to make this! Great tips on how to be a good guest as well! Quite an entertaining post...If someone were to burn my sheetts, and gift me Jaipur sheets to compensate, I would be so very happy:). Cheers! Oh my! Mango panna cotta looks so beautiful! Bookmarked. 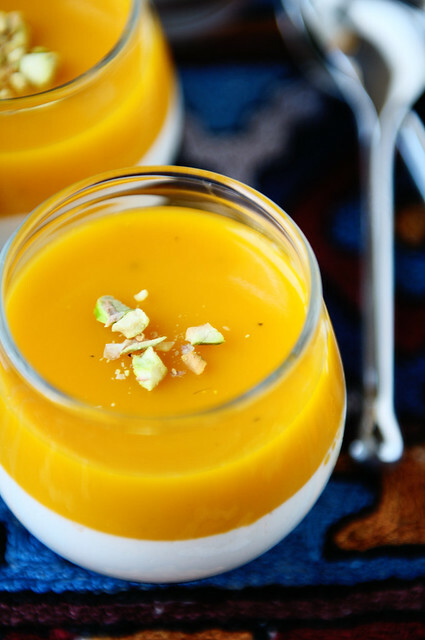 Mango Panna Cotta is really delicious...Awesome clicks. And I feel deeply for your embarrassment, having had similar misadventures - but feel that we get a little more uptight about these things while living in the US. I find myself turning a bit more forgiving when transgressed against and a bit less upset when I've goofed up when I'm in India, simply because so many unexpected elements are at play in that land of beautiful chaos. And as embarrassing and troublesome as it is, its nice to be reminded that you cannot control the simplest of things sometimes. Seriously, you know you're welcome anytime (unconditionally). The panna cotta looks lovely. I recently made some and found Indian flavours, especially saffron work really well. Almost thought you'd joined the DBs. I've done worse things. Okay, worse thing. And gross. I will leave it at that though it was no fault of mine, okay? It was a 'mechanical' error. That said (phew!) I'd help with the washing of dishes. I dont' trust myself with machines - so vacuuming is out. The sheets? I didn't think of it, simply because I'd not be comfortable if my guests did it. If nothing works (if there's a perfect host - I usually end up hating them) I just stand and flash this winning smile that won me a slave who is good with the kids. If the guests don't have kids, it's okay. The slave works great with older people too. So, I switch on my charm and the slave figures out everything else. Best? I stir. Stir anything and everything. Until I stirred paneer when I was newly married to see all the curds spread again. I was saved because I was newly married. And as is obvious, I do make myself extremely comfortable in others' spaces. Wowo you are a perfect guest, doing the washing etc......... wowo . You may come and stay with us, but have to warn we dont have a big placr so you have to take Shyama's room as she is only comming on weekend and it is empty during the weeday and share the bathroom with us. Looks like Anita is a good friend, friends like that dont come very often. Love pannacotta and your pictures are beautiful. Waiting for Anita's comment ;-) But water situation is so bad in B'bay or was it a temp thing ? Usually my visits to India coincide with the water pump in my parent's building needing a major repair. It would seem they patiently wait for me to land. About being a guest, I would help around tasting things in the kitchen ,do the dishes and make the bed. You can come stay at my house any time, even if you burn the sheets! I just love this story--Medha's reaction is priceless. I loved how beautiful this was and not too sweet--plus, the little crunch from the nuts was divine. Thanks for having me at your table! You post is hilarious !! You should remember any thing that can go wrong will go wrong in India .. :) Something like this always happens to me all the time .. I am so glad that it's winter and my windows are closed, otherwise my neighbors would think I was mad for laughing so hard! That is the tops! And Medha's triumph! L.O.L! So, did you make this pannacotta for Anita while you were there - or do you believe that you can apologise virtually ;) Just kidding - your post is so apologetic, I almost felt annoyed that the floor didn't open up to spare you the embarassement! You know what when I try to help, people feel she will use more soap to clean the dishes and that's all you can help in doing in India. Yeah but I can cook for an army. One thing am in demand for is to teach a new recipe to most people I visit so it's easy. But frankly I visit mostly family very rarely friends for a stay over and those who can stand me pamper me and I like to treat my guest royally when they visit me or stay over. In India you don't really need to help with the washing and cleaning as there are helpers in most homes rite infact even if you just help in the kitchen with the cutting veggies and laying the table and making the beds that is considered a lot. In Maharashtrian traditional homes if you help with serving food as in pangati la vadhane you will be praised no end and might even get a glass of extra taak/ buttermilk for doing it! Here pahune are treated as GOD so no one really expects I guess, in the country side they don't even let you pick your plate. It is considered an insult to the host. I think what they do say is you treat us equally well when we come over but don't do any work now and if you don't then you are dead! The whole world will know what a bad host you are. LOL! oops that was a along one and I forgot to say the mango panna cota makes me drool!!! Anita is sweet and I can so imagine what you might have felt that too with Medha catching you do it! It was an awesome read!I was in the US before i settled down in India..know how it is in both the places when it comes to guest etiquette. But i on a personal note don't leave my laundry, dishes, or my room cleaned up by the host..it shrinks me in to a hole while i leave it to them! I was very able to related myself so much to the post! This post was a riot... I was in splits!! Anita... must be a very gracious person indeed. Though I sympathized with you, Medha's reaction took the cake.... it kinda made me enjoy the situation you were in. Apologies!! :) It is true, I wasn't attached to the sheets at all. I used them only because they were new...And if you got me that looked a lot like the one I already had, well, that only proves that our tastes match! No need for apologies at all. But, I wish I had paid more attention to Medha at that time! It would have been very nice indeed if we could have found the time to cook together and you could have shown me how to make this panna cotta! I think I will use the gelatin finally and make this easy dessert anyway. Thanks for the recipe! PS: I look forward to having you over again. I really do. There was a typo in the recipe. It is 1 quart of half-and-half, not 1 pint as I had mistyped earlier. Sorry about that! Livia, I find it is always better to ask so that I understand what my host's comfort level is. That helps avert the feeling of being pushy. As you can see, I don't unmold my panna cotta so any problems with that become non-existent. Otherwise, it truly is a very easy dessert to make. try it! Mistress, thanks! I love mango and there's nothing in this world that is quite like the Indian mango. indu, I'll be over soon! Seven Spice, you are too cute! Thanks! sacredfig, you had me in fits of giggles! Rajnikant of all people! The rest of my India trip may pale in comparison to the stuff I did at Anita's though so be prepared for that! No Daring anything for me. I have my own escapades that are enough to adrenalin rushes! Nandini, I won't ask! It doesn't take much to put sheets in a washer and then into the dryer. However, I like to minimize water usage and maximize washer load so I don't assume otherwise for my hosts and always ask first. Happy, Anita is a very special friend, yes! I would love to visit you some day and be treated to live music as I nibble on all the treats you make! Bong Mom, it's both. Water is a scarce resource and the pump broke down. Mera naseeb! TKw, it was so good to see you and laugh with you again. Thank you for the shrimp with the oomph and the raita! Delicious! As for Medha, she is always waiting for an opportunity like this! Let's meet again soon! I have some dishes that belong to you. Searching, heh, with me in the picture, anything that can go worng will go wrong anywhere in the world! Pel, I can laugh now. Then, it was just the worst thing ever! Miri, the iron was very hot I guess? Before I knew it, the sheets went *sizzle! * I might have made it for Anita but I was to busy eating and getting in as much time as I could with her! So, this is virtual. Anjali, gavath nirala asta. Here in the US, most of us don't have housekeepers or maids. If at all, someone comes in a couple of times a month to dust, clean the floors and bathrooms, etc. We do everything ourselves - from cooking to dishes to laundry to cleaning the toilets. So when I stay with someone, I know that there is additional pressure and I try to help without making a nuisance of myself. Jen, *grins* yeah! If I stay, I'll strip the sheets but won't do your laundry and dishes, ok? I know Kaweah takes good care of the floors! experiments, you have to adjust to several things: your host, the culture and whether maids abound! But even when there is help, I find myself picking up after ourselves just because it has now become second-nature. Ameeta, Anita is very gracious, welcoming, accomodating, a sharp shooter and always moving. Looking back on it, I still wish it hadn't panned out that way but what's done can't be undone so I learned and moved on. Never ever iron on a bed without a thick sheet underneath. Amen. Anita, my sweet friend, there you are! Being gracious all over again! Did you make shirts for everyone from those sheets as yet? If there's spare material, maybe you want to make one for me, too? Then we can all pose for a picture and look like some dysfunctional family. Make panna cotta and also make Kitt's fruit terrine. Both are worth it, definitely! I wasn't much a fan of panna cotta but with mango and other toppings, I like it a lot now! Many hugs to you! I will be back! Oh my. I wish I had taken off the bed sheets and put them in the washer. I never do that, because when I have guests at home, I usually leave the used sheets on the bed until right before the next guests come (no need to get the fresh sheets dusty). Gabi, please don't feel that way! This post is not an expectation of what guests should do in my home. It's what I do when I am a guest. Besides, I work from home, making it so much easier for me to do it at my convenience. Also I put a whole bunch of other sheets at the same time, making it easier if I do it. Try the panna cotta, I think you will like it! Priya, thanks! We all try to do our best, I am sure. webdework, this is the second time that you've left the same comment with a link drop. I deleted your previous comment as well as this second one. You are welcome to join the conversation but I do not appreciate link drops. Please add the link to your blogger profile and if anyone wants they can click through from there. Take this as well-meant advice. Any more comments of this sort will just be sent directly to spam. Thanks for understanding! Manisha, any time you come to London remember that you are very welcome to stay with me. If guests ask what they can do to help I always ask them to remove bedsheets etc. As for helping in the kitchen all hands are always welcome. I think you should send this my way! Mangoes are currently in season in this part of the world and I am so tempted to make a dessert like this. It looks really great. I just have one question. How many grams is gelatin bag? Farah, hey there! Long time! And you bet I will look you up when I make it to London! souperior, thanks, that's a lot of praise! It might go to my head if you keep it up! But please do! ;-) Btw, I *love* your handle! Ljilja, thanks! Here's what it says on the back of each packet: "Each 1/4 oz envelope is ready measured to make a pint (4 to 6 servings) of gelatin. If recipe calls for '1 tablespoon of gelatin,' use one envelope to achieve same results." Does that help? I wish I had read this post earlier. Somehow I never thought about it, one of the reasons is, I am not comfortable my guests doing anything in my home. So if any of the hosts said - 'leave it I will manage', I took it on the face value!!. Very very bad guest, but next time I will be more careful. lovely panna cotta, Really inviting and cant resist taking a bite frm ur blog. I may not be comfortable with guests washing the sheets/towels, but the mere fact that they would be considerate enough to offer would be a BIG plus!